Uniqlo, the Japanese casual clothing retailer, continues in its efforts to grow internationally with the launch of its first global branding campaign. In an interview with Campaign earlier this year, Fast Retailing’s president of global creative, John Jay, said that building awareness and understanding of the Uniqlo brand in the US was a priority. The Science of LifeWear, a new global initiative, appears to be a step along that path. 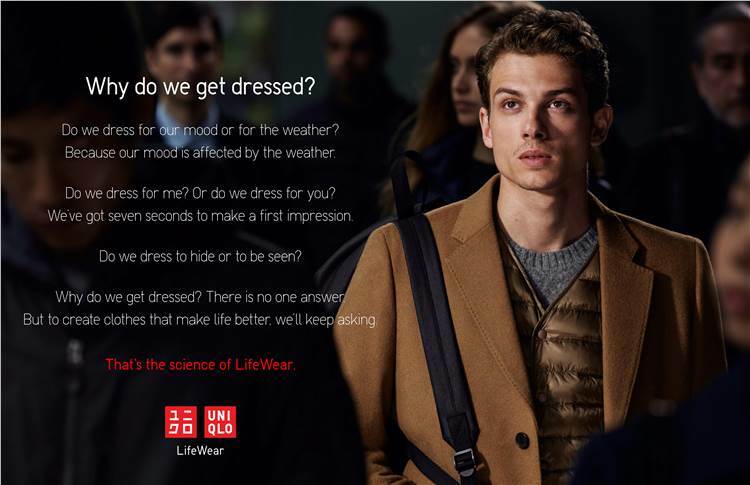 According to a statement from Uniqlo, the campaign, which includes brand and product-related films and other supporting materials, is designed to highlight the brand’s "relentless commitment to quality, functionality and style". The work was developed by Droga5 in New York. Uniqlo defines LifeWear as "innovative high-quality clothing that is universal in design and comfort and made for everyone, everywhere". Through this campaign, it aims to encourage people to consider their attitudes towards clothing by asking, "Why do we get dressed?". In aiming to be a global brand, Uniqlo nonetheless emphasises its national roots, with the film set against the backdrop of Japanese urban environments. In the statement, Jay said: "By producing a global brand message from Japan, we are being authentic to our origin and who we are." "Our endless curiosity to explore the meaning of clothing is at the heart of our new campaign," he added. The campaign begins in Japan and will subsequently air in other key markets around the world. It builds on the LifeWear book and prominent advertising in publications such as the New York Times, which Jay worked on shortly after joining Fast Retailing. Campaign’s view: The more cynical among us may question the intellectualisation of mass fashion retail, which does not naturally lend itself to deep thinking. But by highlighting the simplicity of its products and inviting people to consider why they choose the clothes they do, and the reasons for wearing clothes in the first place, Uniqlo does succeed in standing out from the crowd as a more thoughtful, higher quality player in a sector that is sometimes known for its ‘churn and burn’ approach to business. This article was first published on Campaign Asia-Pacific.